REFRESHMENTS – Everybody is cordially invited for refreshments after Sunday Mass at both St Bernard’s and Our Lady & St Peter’s churches. GIFT AID OFFERINGS/DONATIONS – can be taken out at anytime throughout the year. It is a valuable source of additional income for the parish with no extra cost to the parishioners. A PATH THROUGH THE DESERT FOR GOD. ADVENT RECONCILIATION SERVICE – a change to make confession to prepare hearts and mind to celebrate Christmas. 7.30pm Thursday 17th, OLSP. 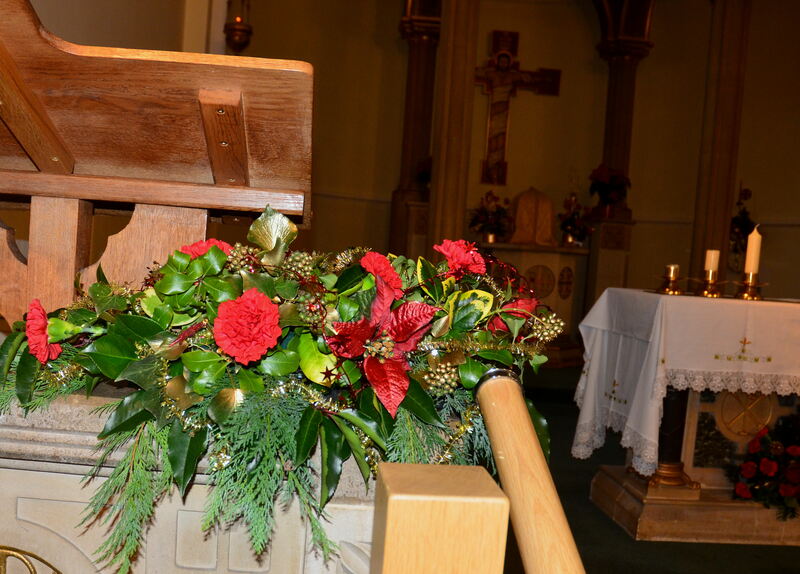 A SECOND COLLECTION – this Sunday just at Our Lady & St. Peter’s for flowers at Christmas and beyond. Your offering can be Gift-Aided. Thank you. MISSIO RED BOXES – Would boxholders please collect their counted boxes from the usual window ledge by the church doors. Thank you for your generous contributions and to our helpers with their counting. BIG CLEAN – of OLDP, 10.30 – 12 on Saturday morning (19th). Please come and lend a hand. Many hands make light work. 2 CLEANERS – needed for OLSP – 2 more volunteers needed to go on our Rota of Cleaners. Can you spare the odd hour once in a while? Please let Fr. Steven know if you can help? (He is also on the Rota – so anyone can do it! 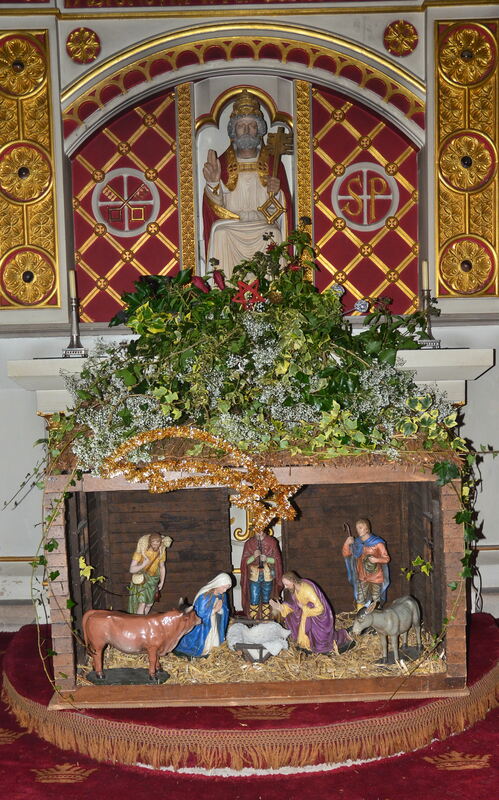 SPECIAL THANKS – to our altar server Charlotte for her excellent work in refurbishing and repainting the Christmas Crib which has been in need of some tlc for a long time now. Displayed on the altar at OL&StP at Masses last Sunday, it is now moved outside for all to appreciate. Amongst the town’s myriad of Christmas lights, have you spotted many (any?) other Nativity scenes? Thank you, Charlotte. Parish Christmas Lunch – Another great parish social gathering – very well attended and thoroughly enjoyable. Thanks to all who came and made it such a grand luncheon party – another one to remember – and special thanks to the ladies on the Lunches Team who once again fed us all so very well. CHRISTIAN MEDITATION GROUP – We are having a break over Christmas and will be meeting again in the New Year. READERS – Please sign up for Christmas Services – list at the back of the Church. CHARITY MEAL – Thank you very much to all those who attended the charity meal for St. Catherines Hospice on Monday 30 Nov. at Tarana Lingfield. The total raised on the night was £1500. AN ORGAN RECITAL FOR ADVENT – Sunday, 13th December 7.30pm. The internationally acclaimed musician D’Arcy Trinkwon is the Organist of Worth Abbey. He will play a glittering selection of music appropriate to the season, including Bach and several “Noels” given virtuoso concert treatment by 17th and 20th century French composers. Voluntary Contributions. A CORDIAL INVITATION – Next Sunday we will have our Christmas Mulled Wine refreshments in the parish centre after 10.30 Mass. Hot sausage rolls and mince pies included together with tea and coffee as usual. Also the Christmas 100 Club bonus draw for £180 in prizes with still time to join, just contact Chris Pond (327002). CHOIR – We are carol singing at the station on Thursday December 17th from 5.30pm-7.30pm. If anyone would like to join us from the parish they are very welcome. CHRISTMAS GREETINGS NEWSLETTER – We shall be producing the Christmas Greetings newsletter again this year, to be published 19th/20th December. If you would like to make use of this please let Simon Parr (E.G. 323493/ simon.sparr@sky.com or Muriel Cheesman (E.G. 327512/ murielcheesman@hotmail.com) have your copy by Monday, 14th December. Our charity will be Crawley Open House. Advent Tree for Crawley Open House – please take a label from the Christmas Tree at the back of OLSP and bring the item on it back to church up until Christmas week when there will be a special delivery. Thank you. 2016 CALENDARS – Complimentary copies of the Missio 2016 calendar are available from the church table at OL&StP for all Missio members and any parishioner who would like to have one. CHRISTMAS Day LUNCH — if you live alone and would like to have lunch in the company of others,Trinity Methodist will be serving a meal. Telephone either Mary Nichols 322573 or Ann Balfour 529101 to reserve a place (numbers are limited). EG Foodbank – the following items are required please – 500g bags of granulated sugar, Feminine hygiene products, Toilet rolls, Washing-up liquid and Men’s deodorant. Thank you. Also, if you are using Waitrose to shop please note that EG Foodbank is one of the 3 charities to benefit from the Green Token scheme this month so please support them. CRAWLEY OPEN HOUSE – is desperately short of blankets, sleeping bags and flasks to give to homeless people who turn up at the door when it is full. Toilet rolls, UHT milk, sugar and tinned meat are particularly required at present but any tinned and packet food is welcome plus tea and coffee. Please leave donated items at the back of the church at Our Lady and St Peter’s and at St Bernard’s. Larger items, including duvets and clothes to be taken to OLSP, or taken directly to COH near Three Bridges in Crawley. Tel: 01293 447702. Alternatively, if you prefer, please leave a cash contribution in the basket and the SVP will purchase items on your behalf. Thank you. GATWICK DETAINEES WELFARE GROUP – needs men’s shoes, trainers, jeans and sweatshirts jogging trousers (medium and large sizes please) as well as toiletries. 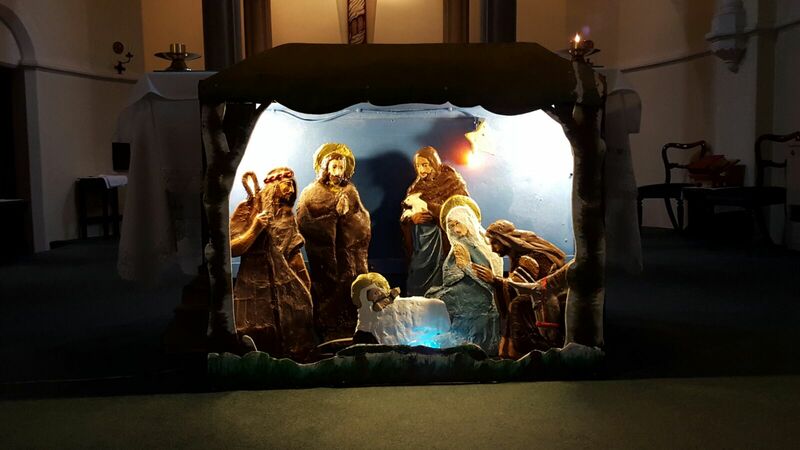 This entry was posted in Newsletter on December 11, 2015 by eastgrinsteadcatholicparish.